A host of Roald Dahl-inspired events, exhibitions, happenings and grassroots activity took place across Wales throughout 2016, celebrating 100 years since the birth of the world’s number 1 storyteller in Cardiff. The Roald Dahl 100 Wales celebrations formed part of the Welsh Government’s Year of Adventure and were supported by the Roald Dahl Literary Estate. It was important for all involved in the planning of the centenary that this would become a Wales-wide and bilingual celebration. To ensure this would happen, Literature Wales, with funding from the Welsh Government, came up with Invent your Event. This new funding and outreach scheme offered financial support for organisers to celebrate Roald Dahl 100 in Wales. A complementary outreach programme with a focus on social inclusion was also delivered by Literature Wales and our partners, making sure that people of all ages and backgrounds were given the opportunity to take part in the celebrations. Quentin Blake: Inside Stories at National Museum Cardiff; Hay Festival; Film Hub Wales and Chapter Arts Centre’s Roald Dahl on Film; The National Eisteddfod of Wales; Cardiff Children’s Literature Festival; Adventure is just a Page Away at National Library of Wales, Aberystwyth; Beyond the Border – Wales International Storytelling Festival; Cardiff University’s Roald Dahl Centenary Conference; Swansea International Festival; Cardiff Metropolitan University’s Fantastic Mr Dahl Conference; Urdd Eisteddfod; Velvet Coalmine in Blackwood; North Wales International Music Festival; and RawFfest – a new national youth arts festival, to name only a few. 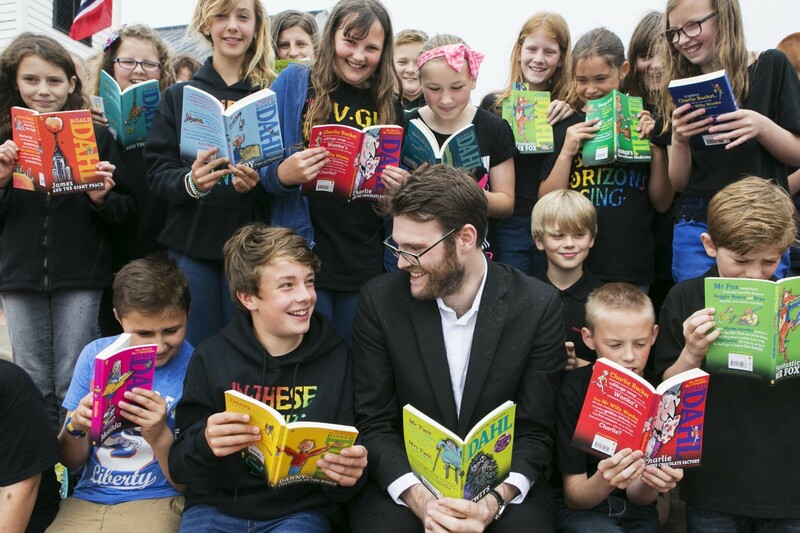 Family-friendly activities inspired by Roald Dahl were also organised by Denbighshire County Council; Gwynedd Council and Palas Print Bookshop, Caernarfon; Oriel Davies, Newtown; Caerphilly Arts Development; and Techniquest in Cardiff Bay. Plus, The Llandaff Society co-ordinated the unveiling of four plaques on buildings in Llandaff that have a historic association with Roald Dahl. Roald Dahl’s City of the Unexpected, produced by Wales Millennium Centre and National Theatre Wales, was a flagship event which put Cardiff firmly on the international map. Thousands of people came to Cardiff on the 17 and 18 September 2016, to witness a 7-metre peach arriving, unannounced, in the City Centre; a mischievous fox being chased by farmers, dodging their pitchforks with parkour, acrobatics and even a nail-biting tightrope walk; and enjoy a great pyjama picnic in Bute Park. A special commemorative brochure featuring just some of the highlights from a spectacular year of events was commissioned by Literature Wales and is available to view online here. So, from Anglesey to Abergavenny, Caernarfon to Caerphilly, Newtown to Newport, this was a truly Wales-wide celebration. Roald Dahl was reintroduced to people of all ages in a way that allowed them to engage with his work using their own creativity and imagination. Reading is one of the most magical acts – as soon as you open a book you are transported to a new world of adventure and imagination. Roald Dahl belongs to all of us – and in 2016, all over Wales, he was found everywhere.